Eat Your City: Brining a chicken or 3... and how to scale up to brine a turkey recipe! Brining a chicken or 3... and how to scale up to brine a turkey recipe! Posted by I've always been intrigued by the idea of brining. Its science meets delicious. Think brine = simple marinade that penetrates the meat and keeps it moist to boot... And its really really easy. All you need is to put together a brine, a large enough container to hold the bird and brine, and at least 4 hours of patience while the brine does its magic! Brines come in weak and strong. I make a fairly weak brine, so you can let the chicken brine minimum 4 hours and max about 2 days. You can make the brine more concentrated, but if you leave the chicken in too long of a concentrated brine, you have to rinse the chicken so its not unbearably salty... and the meat can become... smushy/slimey and not in a good way... that's why I use a weak brine.. foolproof! And finally, don't "guessimate" how long it'll take for the bird to be done. 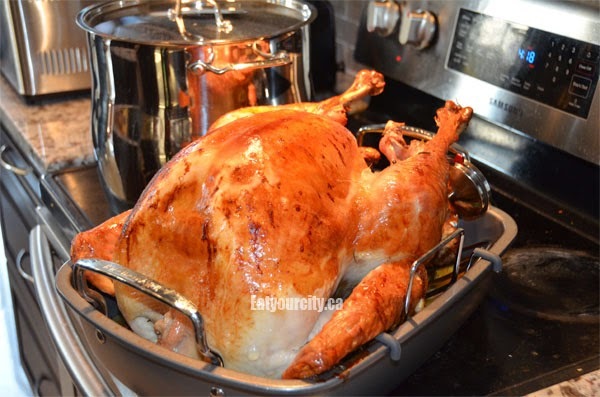 Its worth investing a few bucks for a good meat thermometer so you yank your bird out of the oven before it gets all dry and not waste your efforts in the kitchen! I'm paranoid so I use two - an ordinary one (that is dishwasher safe - yes!) oven safe thermometer as well as an electronic digital one that yells at me when the bird is done ... so yes, you can laugh at how my turkey has not one but 2 meat thermometers poked deep into the thighs, but I like to make sure in case I accidentally stuck one thermometer too close to the bone or outright pierce right through the bird and it'll never tell my my bird is done until its jerky. 2) Take pot off heat and set aside to cool. 4) Add cooled brine and add minimum 6 more cups of cold water (enough so that the bird can be easily submerged). I usually add in a total of 12-16 cups of water depending on the size of the bird. 1) About 1-1.5 hours before you want to stick the bird in the oven, take it out of the fridge, discard the brine, save the herbs and flavorings. 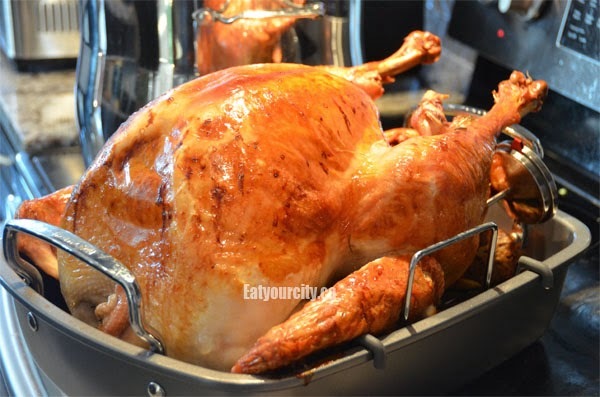 Let the bird sit in a roasting pan to come up to temperature (about 30min). This lets the skin have a chance to dry. Letting the skin dry helps make it super crispy. 3) Add a cup of water to the bottom of the roasting pan (prevents burning). Stuff the herb bundles into the bird, the rest can be scattered around the pan. 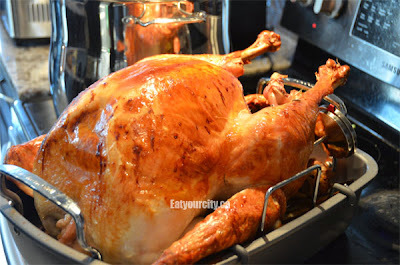 6) Dig into super moist chicken/turkey! !